Most people have experienced bumpsteer at some point in their driving careers. Yes… even you! So what exactly is it, and how can the Steeda bumpsteer kits help? With it being such a widely experienced phenomenon, car manufacturers are well aware, and they do plenty to make sure you experience minimal bumpsteer right from the factory. However, as you start modifying the factory suspension, particularly by lowering the car, bumpsteer may become more of an issue. Any adjustment to ride height affects the suspension geometry, so it’s important to get the front end geometry right and eliminate that bumpsteer any time that you alter your ride height. Bumpsteer is when the car goes rogue and steers itself without steering wheel input from the driver. This is a combined result of bumps in the road and discrepancies with the length or angle of your suspension and steering linkages. As your wheel goes over a bump, it moves vertically up and down. This vertical movement causes the wheels to toe in or out depending on the aforementioned length/angle discrepancies of your suspension. Specifically, the root cause of bumpsteer in your vehicle can be attributed to the tie rods and control arms traveling on different planes from one another along the arc of travel. When the wheel moves up and down it arcs slightly, so differences in length will cause the components to arc at different rates, and it is here that the toe changes. 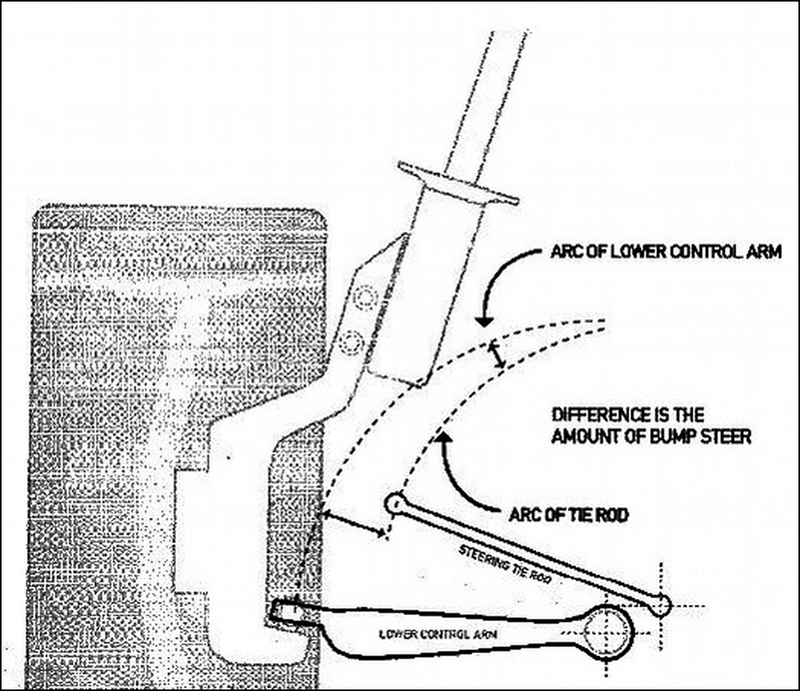 Take a look at the image below (credit: pinderwagen.com) – the tie rod and the lower control arm have fixed points that are not the same, so the arc on which they travel is different. As they move along that arc the tie rod is going to increasingly exert outward pressure on the wheel, causing it to toe out. This phenomenon is called bumpsteer. If you want more in-depth knowledge on the subject, there are plenty of resources online that cover bumpsteer to a more technical degree, but our goal here is to provide a simple explanation. Our bumpsteer kits fix this issue by allowing you to correct the angle of the tie rod so that it matches the control arm. This means they will be traveling on the same plane, in turn eliminating unwanted alterations in toe when the wheels hit bumps. There are other ways to address the issue of bumpsteer, but our kits offer a wide range of adjustment and they don’t require spindle modification for fitment or adjustment. It’s a simple, bolt-on solution that’s the culmination of scrupulous engineering research and design! Click here to see our entire selection of Bumpsteer Kits for your S550, S197, SN95 and FoxBody. To learn more about Steeda’s Bumpsteer Kits, check out these install video below.